Dr Gary Thorn lectured in Modern European History at The Open University (1986–2017) and at Birkbeck, University of London (1999–2015). He is the author of End of Empires: European Decolonisation, 1919–80 (London: Hodder, 2001). His research interests are in Anglo-Portuguese Relations, Portuguese cultural history, and the Portuguese dictatorship 1926-74. He is a frequent visitor to Portugal, and to Lisbon in particular. The book title comes from Aubrey Bell’s Portugal of the Portuguese (1916): ‘Since the murder of King Carlos and of the Crown Prince Luis Felipe on the 1st of February 1908…. A swarm of writers have descended like locusts on the land…’ The methodology is to connect a specific group of critics in the years before the First World War to a constellation of general attitudes about Portugal and the Portuguese-speaking world. Intersecting personal narratives are used, not as an argument for individual agency as dominant cause of historical change, but as contrasting discourses upon revisited events. 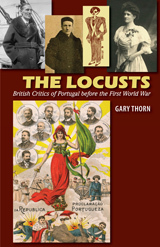 The primary focus is to explain how the critical context of Portugal's history that incubated ‘The Locusts’ crystallised into the pressure group to free political prisoners. A key part of that context was the extant campaign against ‘Portuguese slavery’ in West Africa. E. M. Tenison, the Secretary of the British Protest Committee, left a unique 200-page unpublished personal memoir, previously unconsulted by any published historian. The historiography of the First Republic in English is slight. There are no comparative studies in book form, just a few scholarly articles on diplomacy alone (for example, by Glyn Stone, Richard Langhorne). And likewise, there is no study of Anglo-Portuguese relations ‘from below’, i.e. popular pressure to influence government policy. British Critics of Portugal before the First World War problematises Anglo-Portuguese relations around the concept forwarded by Amilcar Cabral, and others, that Portuguese colonialism was ‘the colonialism of the semi-colonised’. It makes a broader contribution to the study of empires, and to the causes of the First World War in Anglo-Portuguese–German relations.